So, in this first episode a young teenage girl moves from the country to the big city. She has no real knowledge of customs or social norms in the city, is severely lacking in social and communications skills, and has a strange sort of animal magnetism in which wild creatures of all sorts are drawn to her, and have basically been her only friends throughout her life. 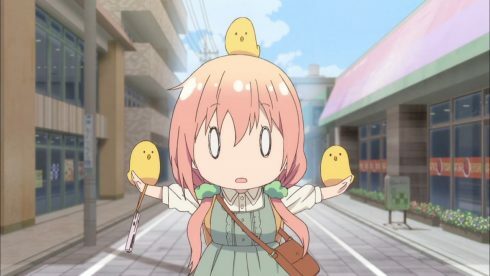 She is quickly confused by the complexity of the city, and has a run in with a law enforcement official, but eventually makes her way to the shop where she will be staying, and meets up with several other quirky-but-cute girls around the same age as her who stay there with her. 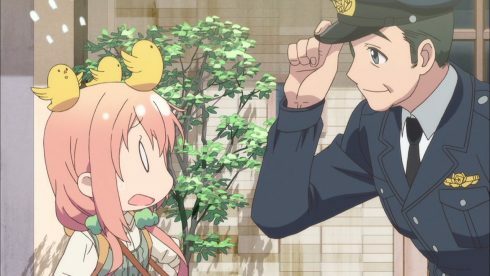 They quickly become friends, and we will follow their daily lives as she seeks to find something important to her in this city. Wait a minute, didn’t we just finish this series? 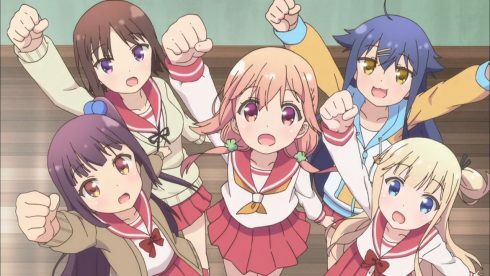 Despite the superficial similarities, Hinako Note isn’t really a retelling of Urara Meirochou, or of Gochuumon wa Usagi Desu ka, or of any other Cute Girls Doing Cute Things series you might choose to name. Instead it is simply itself: a unique creation that may be built with some of the same components, but whose final form is altogether different. 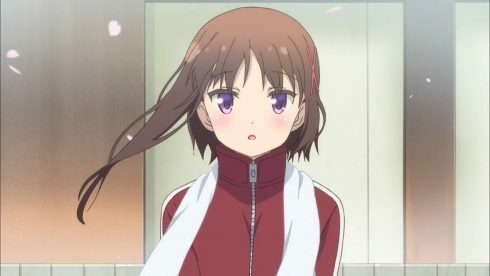 Our first key piece is Sakuragi Hinako, our protagonist. She’s a country girl who has moved to Tokyo to go to high school. 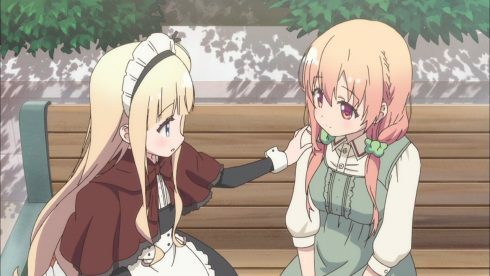 She suffers from acute social anxiety, causing her to freeze up whenever a stranger (especially an adult) talks to her. 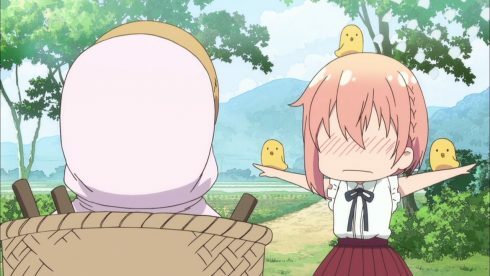 This results in her rather comically taking on a stance much like a scarecrow, but despite it being played for laughs, social anxiety is not fun. I feel for her. 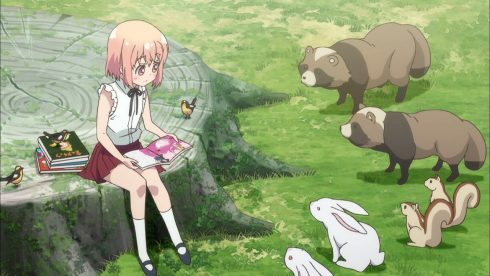 She also has a curious ability to attract animals; most often a trio of birds that show up whenever she freezes to sit on her arms and head, completing the scarecrow image… even if she’s indoors; but all sorts of wild animals are also drawn to her and seem to be completely at ease in her presence. She used to read to them in order to try to practice getting used to talking to people. 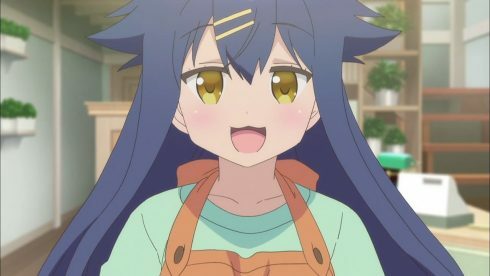 Next is Natsukawa Kuina, who works as a clerk in the bookstore the girls live at. 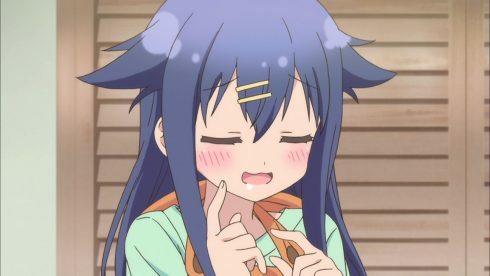 Kuina is a pretty girl (so stated by Hinako), with a tendency towards gluttony: she seems to be constantly hungry, and she judges her interest in a place by the sorts of food she can find there. 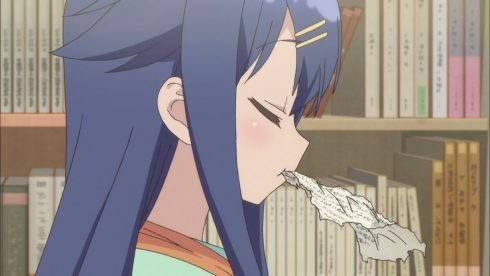 She also loves to read, but apparently loves it so much that she absent-mindedly ends up eating the pages of the books she’s reading. …I’m not quite sure what to make of that. 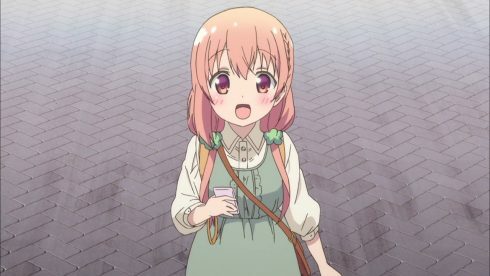 On the other hand she’s very cheerful and friendly, and manages to burst right through any nervousness Hinako probably would have had about just meeting her and get her talking right away. 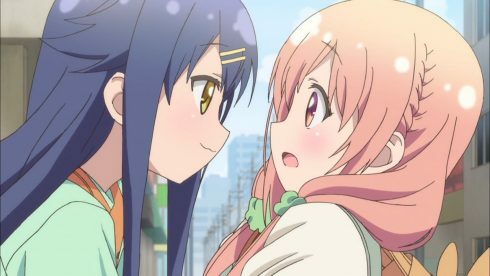 Hiiragi Mayuki is the third girl we meet. 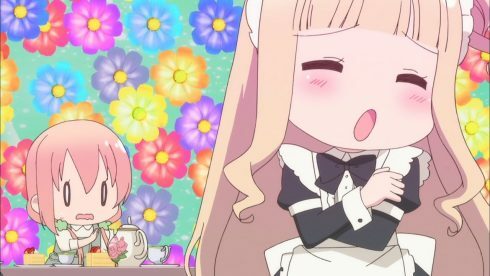 She works in the cafe that’s attached to the bookstore, and wears a maid uniform constantly. 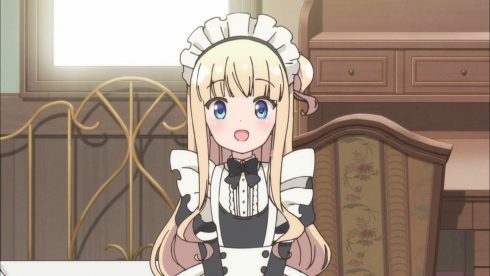 At present there’s no indication those two things are related: she seems to simply like wearing the maid outfit and thinks of it as perfectly normal casual clothing. 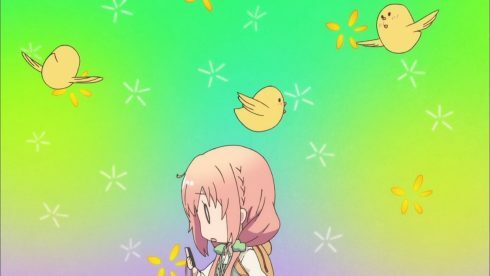 Hinako quickly decides not to pursue the matter any further. 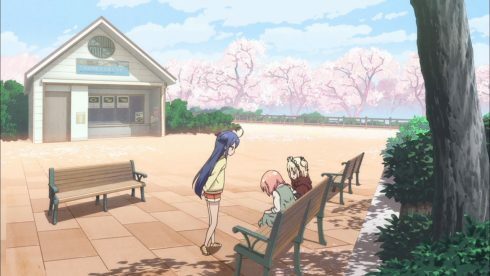 Mayuki is also the smallest of the girls, looking much like an elementary student, but in fact she’s a year older than Kuina and Hinako. She sort of oscillates between acting older and acting younger than the two of them depending on the mood and the comedy of the scene. Given that that’s really fairly standard teenage behavior, it probably doesn’t mean much. 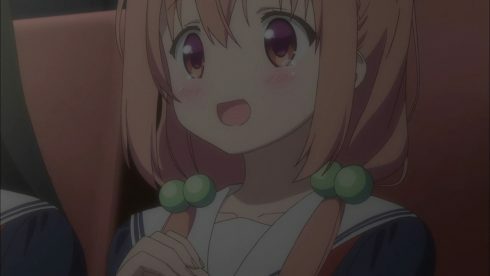 It is interesting to see that Hinako chose to come out to their high school in order to join a theater club, after being inspired by a middle school field trip to see a play in Tokyo. Given how nervous she gets just dealing with an ordinary conversation, that is not something I would usually recommend. Even people who don’t have trouble talking to others can suffer from stage fright when they find themselves in front of a crowd. On the other hand, if that’s her dream I’m not going to deny her the chance to pursue it. 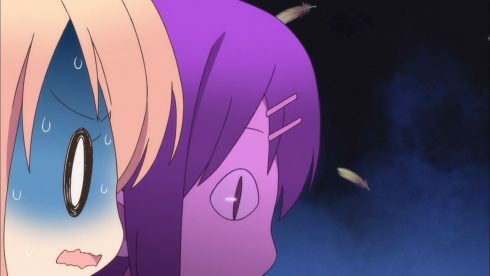 After all she’ll have plenty of difficulty of her own, given that her new school’s theater club closed down last year. The girls’ trip to the park is interesting and curious to me. 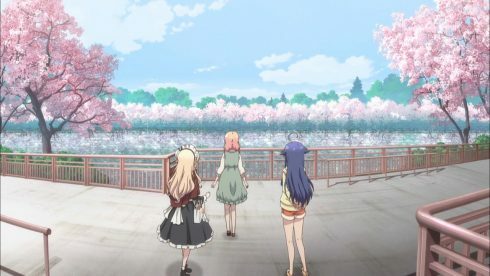 They walk into a wide open and empty walkway, running alongside a pond with lots of blooming sakura trees. There is no one around. 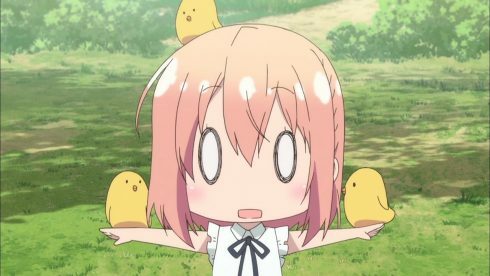 Hinako exclaims in delight and walks a few steps forward, staring at the trees for a few seconds before turning back to talk to the others, and finding herself surrounded by dozens of people on both sides. Many of them were clearly walking along the walkway, but all of them have stopped and turned to stare at her, with an expression on their faces like they think she’s some kind of freak. 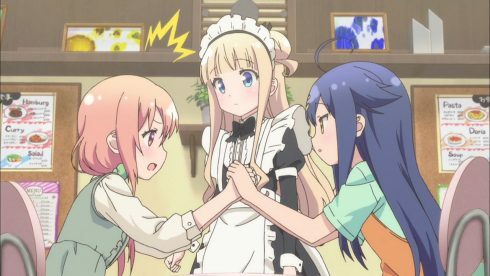 Of course she panics and freezes up, and her new friends have to help her out of the situation. I can’t help but analyze this a bit. Probably over-analyze, because this is a comedy, and certain stuff that should be impossible will likely just happen because the author thought it was funny. 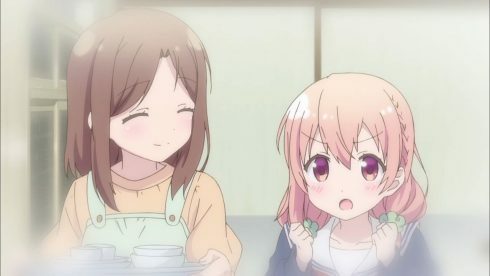 But regardless of that, I kind of feel like we see this scene from Hinako’s perspective. 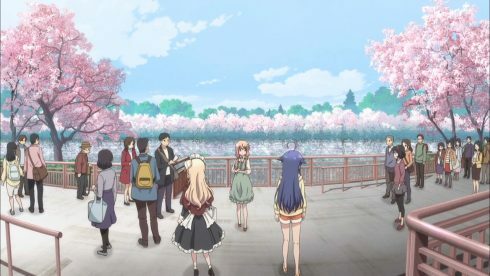 When they first entered the park, perhaps it’s not so much that there weren’t any people around, but rather that she simply didn’t notice them, because her attention was caught by the beauty of the park itself. It wasn’t until she turned her attention away from it that she suddenly noticed the people around her. 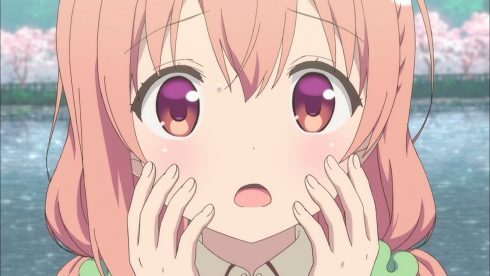 And as for the people, how likely is it, really that a whole crowd is going to stop and stare with such surprise and disgust at a girl who makes what is probably a pretty common exclamation at seeing the place? However, from the perspective of a person who is very nervous around people, suddenly finding herself in the middle of a crowd when she was talking without having been aware of them would make her feel like they were all staring at her. If so, it’s going to make the hurdle she has to overcome to start acting on stage even bigger. 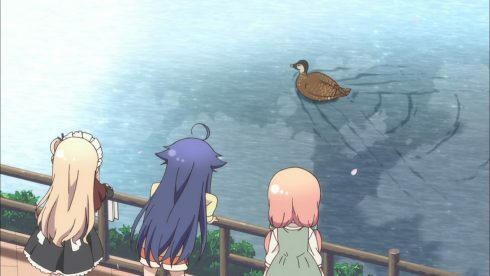 Putting that aside, along with Kuina’s curious interest in ducks (I too was worried she would want to eat them! ), we at last meet the fourth girl to be introduced: Ogino Chiaki. 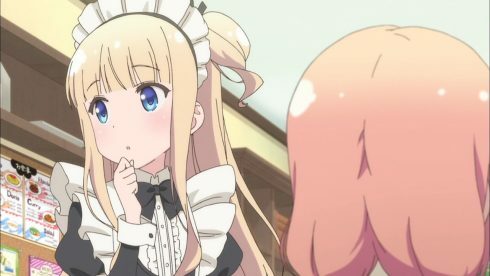 She’s Mayuki’s classmate, a former member of the theater club, and the landlord of the building where the girls are staying. How exactly a second-year high school student came to be the landlord of a multi-business and residential building I do not know, and it’s hard to imagine a soft-spoken girl like her standing on stage, either. But it’s her theater club connections that get the attention for now. 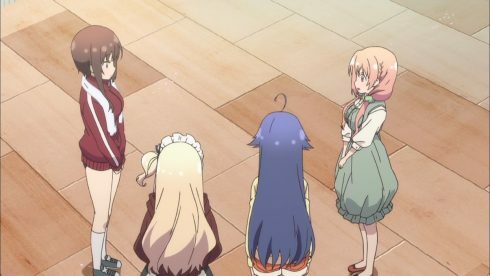 Apparently the club is actually on hiatus until its advisor returns from a trip, rather than having been shut down, which still leaves Hinako uncertain of what to do. Chiaki suggests that she form a small theater troupe, with the four of them as members. Of course, Kuina and Mayuki are a bit surprised at finding themselves “volunteered” for this. 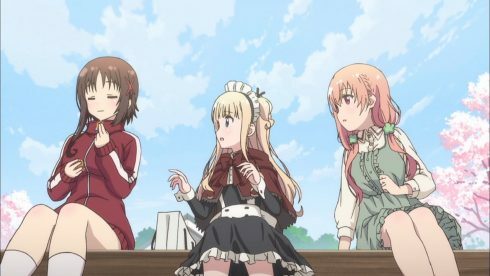 The day caps off with a scene of Hinako taking a bath. 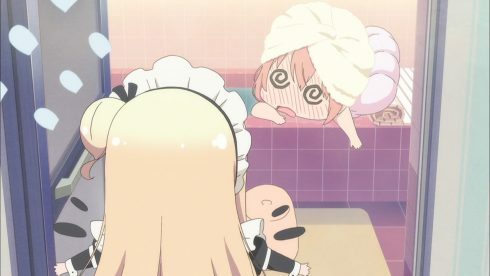 I’m very much reminded of the days of Hidamari Sketch, where each episode would end with someone, usually but not always Yuno, taking a bath and thinking over the events of the day. 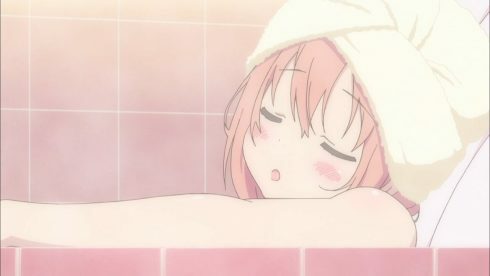 That’s basically what Hinako does here, even complete with floating bath toys, although the camera angles in this bath scene are definitely more on the fanservicey side. 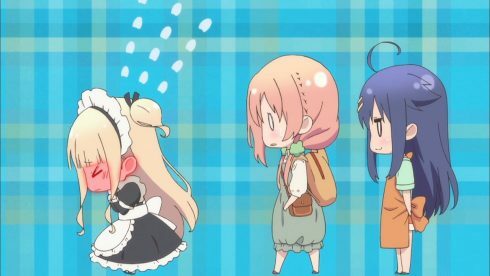 Of course, Hinako being a bit of an airhead, she spends too much time in the bath and gets overheated, and the others end up having to rescue her. 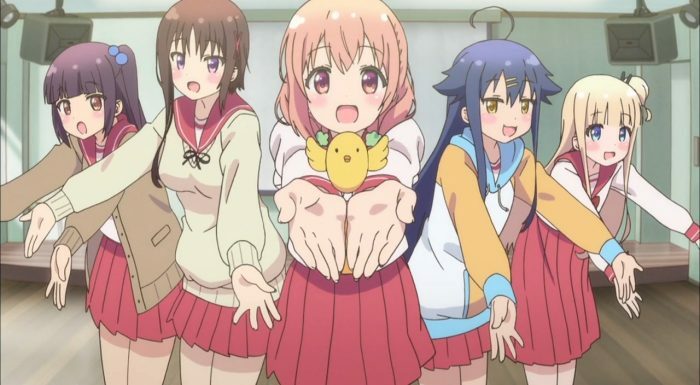 So, in the end, this appears to be another series of cute (if slightly odd) girls doing cute things. In this case the cute thing is going to revolve around stage acting. That should be good to see, I think. 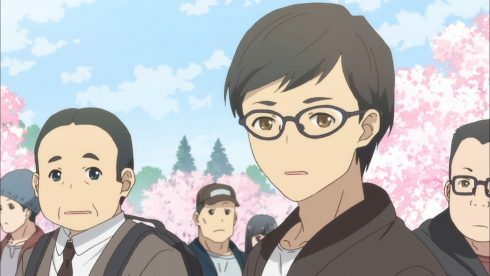 Plays and such are not uncommon in high school based anime, but I don’t remember off the top of my head having seen a series that actually focused on the idea. 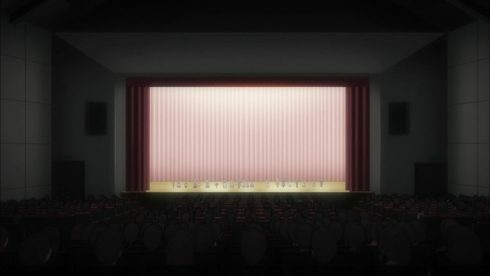 Of course, there’s always the question of how much attention will be on the theater concept itself, given that these kind of series are generally more character-focused, but still I think it will be interesting. 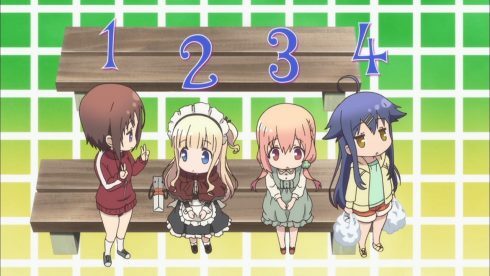 We met four girls in this episode, and the OP/ED indicate that a fifth one will be joining the main group, with a sixth sometimes appearing as well. I’m looking forward to meeting them… and seeing what sort of weird quirks they have. As is often the case I’m not committing to covering this series all the way through just yet. I want to see a bit more before I decide. 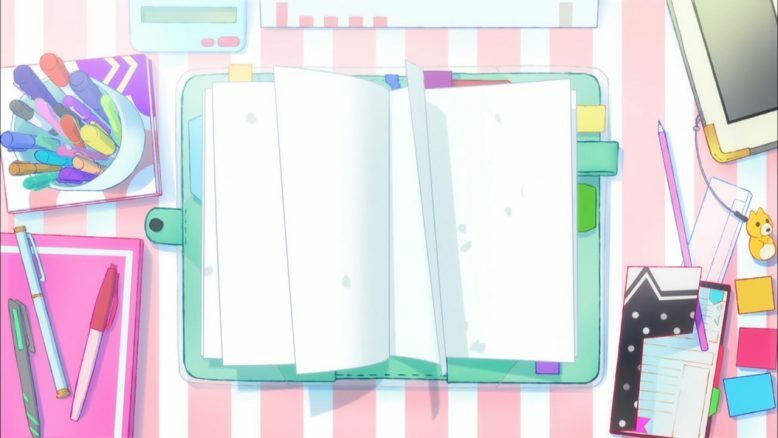 I actually wanted to talk about the symbolism of… well… Hinako’s notebook, particularly the shot where it’s flipping through a bunch of blank pages, but my brain isn’t up to it right now, and this post is long enough as it is.